Are you ready? Asia’s biggest bike carnival, India Bike Week is back again to make your heart skip a beat with those growling chariots, extravagant fun, fancy music, thrilling competitions and lots more. The fourth edition of IBW 2016 will be held at Arpora Sporting Ground, Goa. 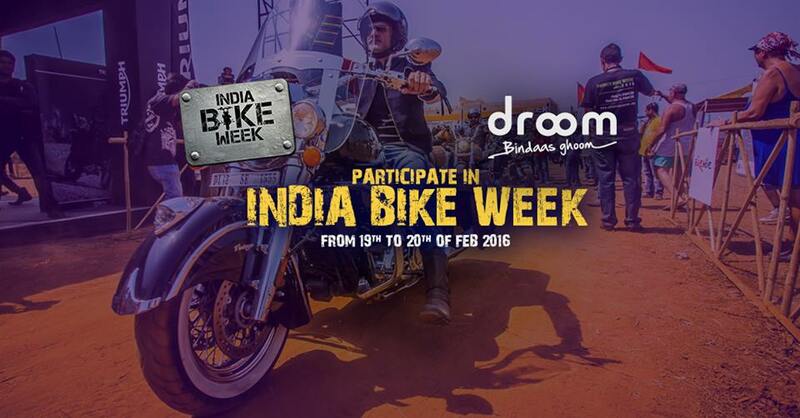 Droom is proud to associate with the IBW to bring unlimited fun to all enthusiasts. Scheduled on 19th and 20th February 2016, India Bike Week is expecting 12,500 aspirants who will be firing up the bikers’ battle field with breath taking stunts and exotic beauties. Bikers from across the globe will be joining the event to share their experiences and knowledge. Along with peppy music and lively bands, you will be able to adore some custom made bikes, uniquely crafted in various designs that will be a sure feast for the eyes and hearts. Droom will be celebrating the love and passion for motorcycles, by building a Droom Moto Mart. Bike riders can take advantage of this shopping spot to buy and sell their motorcycles. Also there’s a hard to miss opportunity to win a super-gorgeous custom made bike – ‘Akaalya bike’ designed by Mean Green Custom, especially to woo the gazers coming at IBW. Droom is organizing a raffle draw where you can register online, and stand your chance to win this mechanical beauty. The bike will be unveiled curtains will be at ground zero by Droom. In short, there’s lot of action waiting for you, click – https://droom.in/ibw to stay update, book your tickets, and more. IBW is a true expedition for experienced bikers. And Droom will be adding icing on the cake with amazing freebies, raffle draw, and moto mart. Stay in touch for more updated on happening at IBW.